I taste a lot of wine, and not all of the good ones make it into The Irish Times, as there simply isn’t enough space. Here are a dozen great reds to try out over Christmas. Some come from my Saturday column in the magazine, some from my wine guide and some are recent finds that I’m mentioning for the first time. All of these are available from independent wine shops and off-licences. This domaine’s Abouriou (€29.50) is a great wine, but I have always had a real liking for this delicious (and biodynamic) light, summery red with smooth, delicate dark fruits that grow on you with every sip. Great value for money, too. From Terroirs, Dublin 4. 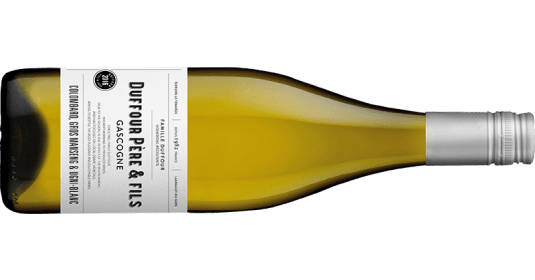 Below are ten of my favourite white wines of 2018 (actually I’ve cheated; there are twelve), and all are available from your independent wine retailer. I have indulged myself and included a few more expensive wines. This is the time of year to splash out a little; believe me you will notice the difference when you pay a few euro more. This is an old favourite of mine, a clean, bright, breezy wine, all crunchy green apples and lemon zest, finishing bone dry. 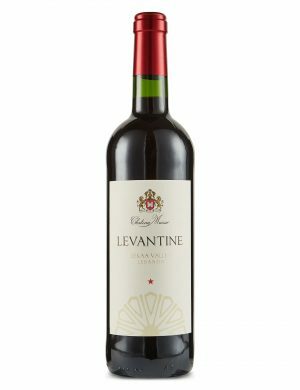 With a mere 10.5% alcohol, this would make a great aperitif or party wine; alternatively with light salads and shellfish. From Vanilla Grape, Kenmare; Whelehan’s Wines, Loughlinstown, Co Dublin; Nolan’s Supermarket, 49 Vernon Avenue, Clontarf, Dublin 3. Wonderful, subtle, elegant dry white with succulent peaches and pears, balanced perfectly by a mineral acidity. Great value for money. From Red Nose Wines, The Regal Centre, Davis Road, Clonmel Co Tipperary. I enjoyed this wine on several occasions in 2018. 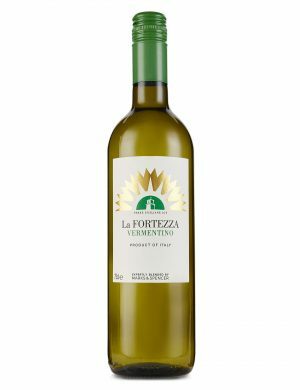 Delicious light Soave with a waxy touch, some peach and yellow apple fruits mixing in with marzipan and a lively streak of mineral acidity. Made from biodynamically grown grapes with minimal sulphur, it has a pleasant leesy touch too. 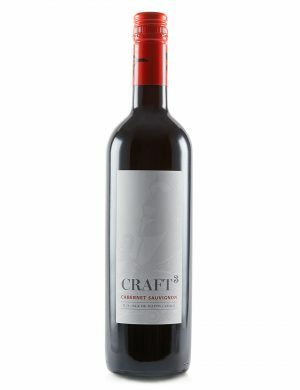 From Le Caveau, Market Yard, Kilkenny; Bradley’s Off-licence, 81 Main Street, Centre, Cork; Green Man Wines, 3 Terenure North, Terenure, Dublin 6W;64 Wine, 64 Glasthule Road, Glasthule, Co Dublin; The Corkscrew, Chatham Street, Dublin 2. 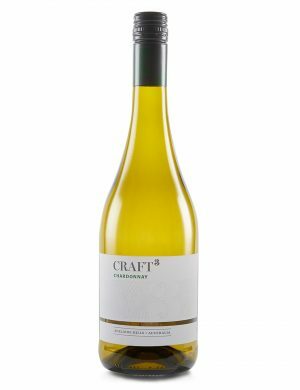 A delicious vibrant, crisp dry white with a beautifully textured palate of orange peel and juicy pears. This would go down a treat with shellfish starters or as an aperitif. 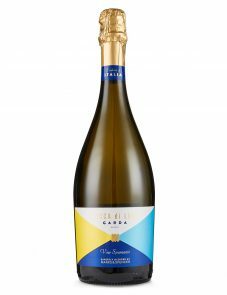 From 64 Wine, 64 Glasthule Road, Glasthule, Co Dublin; Baggot Street Wines, Baggot Street, Dublin 2; Bradley’s Off-licence, 81 Main Street, Centre, Cork; Deveney’s, 31 Main Street, Dundrum, Dublin 16; Green Man Wines, 3 Terenure North, Terenure, Dublin 6W; Lilac Wines, 117 Philipsburgh Avenue, Fairview, Dublin 3; Redmonds, 25 Ranelagh Village, Dublin 6. From one of the best tastings of 2018, a wonderful light subtle unfortified wine from Sherry country. This is fermented in old Manzanilla casks with two months under flor. Lightly floral with subtle toasted nuts, very seductive peach and apple fruits, finishing long and dry. Fascinating wine. From 64 Wine, 64 Glasthule Road, Glasthule, Co Dublin; Jus de Vine, 10 Strand Road, Portmarnock, Co Dublin; Green Man Wines, 3 Terenure North, Terenure, Dublin 6W; Martin’s Off Licence, 11 Marino Mart, Clontarf, Dublin 3; Loose Canon, 29 Drury St, Dublin 2. 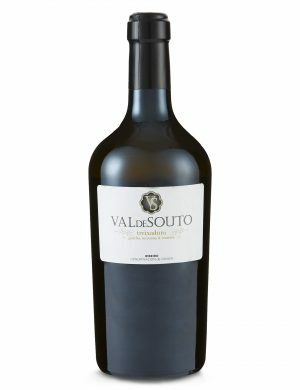 Utterly delicious, delicate wine with a fine saline vein running through the mouth-watering pear and green apple fruits. Light but full of flavour, this lingers beautifully. Made by Luis Seabra, formerly winemaker at Niepoort, this is one of my favourite wines of 2018. A must-try wine. 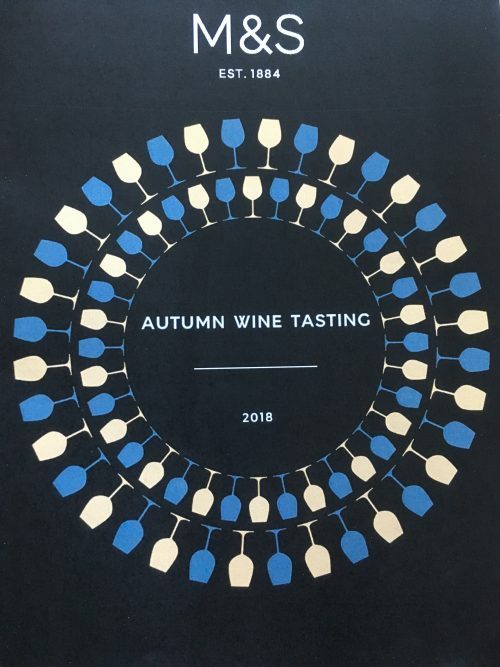 From 64 Wine, 64 Glasthule Road, Glasthule, Co Dublin; Green Man Wines, 3 Terenure North, Terenure, Dublin 6W; Baggot Street Wines, Baggot Street, Dublin 2; Clontarf Wines, 48 Clontarf Road, Clontarf, Dublin 3; Redmonds, 25 Ranelagh village, Dublin 6. One of my all-time favourite wines. Textured and creamy, with plump pears and peaches, a subtle nuttiness, shot through with a lively acidity. If you want to splurge, their As Sortes (€50) is even better with your Christmas starter and turkey. Some shops have it in magnums. This is the wine I will be drinking this Christmas, and not for the first time. From Jus de Vine, Portmarnock; La Touche Wines, La Touch Place, Greystones, Co Wicklow; Whelehan’s Wines, Loughlinstown, Co Dublin; Martin’s Off Licence, 11 Marino Mart, Clontarf, Dublin 3; 64 Wine, 64 Glasthule Road, Glasthule, Co Dublin; Baggot Street Wines, Baggot Street, Dublin 2; Blackrock Cellar, 23 Rockhill, Blackrock, Co Dublin; Clontarf Wines, 48 Clontarf Road, Clontarf, Dublin 3; Green Man Wines, 3 Terenure North, Terenure, Dublin 6W; Sweeney’s Wines, 6 Finglas Road, Hart’s Corner, Glasnevin, Dublin 11; Lilac Wines, 117 Philipsburgh Avenue, Fairview, Dublin 3; Grapevine, 26 Castle Street, Dalkey, Co Dublin; SIYPS.com. A lovely rich dry white, with spicy textured oranges with a subtle note of honey, and very good racy citrus acidity. This would go down a treat wih salmon, smoked or grilled. A delicious, sensual, sophisticated wine with layers of orange peel, peaches and grapefruit; textured and rich with layers of unctuous fruit kept in check by a mineral acidity. Richer seafood dishes or white meats. From Searsons Wine Merchants, 10 Monkstown Crescent, Monkstown, Co Dublin. “As good a Rías Baixas as I have tasted”, read my notes from earlier this year. Gorgeous fresh lively wine with concentrated rich creamy peach fruits, and a strong mineral backbone. Lingers very nicely too. From 64 Wine, 64 Glasthule Road, Glasthule, Co Dublin; The Hole in the Wall, Blackhorse Avenue, Dublin 7; Jus de Vine, Strand Road, Portmarnock, Co Dublin; Green Man Wines, 3 Terenure North, Terenure, Dublin 6W. A deliciously refreshing crisp Chablis with plenty of ripe fruits to balance out the acidity. Long and concentrated, this would go down perfectly with a fishy starter on Christmas day. From Whelehans, Loughlinstown, Co Dublin. 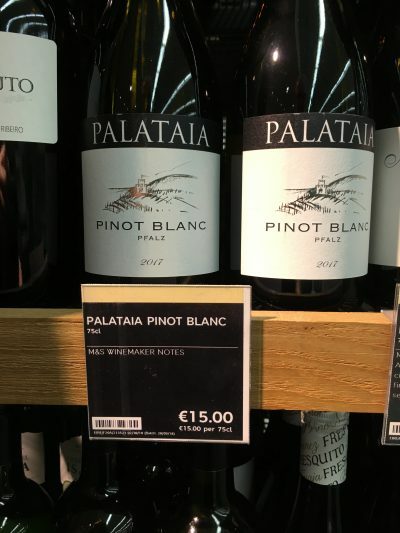 Why would you pay €60 for a New Zealand Chardonnay? Well, because it is a dead ringer for top-notch white Burgundy that will set you back €30 more. Superb, refined, sophisticated Chardonnay that sings class. Fresh and crisp, with a lovely, rich, concentrated centre-palate of precise apple fruits and subtle toasted nuts. From Whelehan’s Wines, Loughlinstown, Co Dublin;64 Wine, 64 Glasthule Road, Glasthule, Co Dublin. This article was first published in the Irish Times, Saturday 15th December, 2018. If Chablis and Mâcon are the traditional Irish Christmas white wines, Châteauneuf-du-Pape and St Émilion Grand Cru or Rioja Reserva are the red equivalents. Turkey is an accommodating bird and will go nicely with most wines, red or white, although I try to avoid tannic wines such as young Bordeaux or Barolo. However, you do need to watch out for the accompaniments – spicy, fruity stuffings and cranberry sauce can kill a wine in seconds. While you won’t go wrong with the above wines (although I would avoid cheap Châteauneuf-du-Pape) this year, why not expand your horizons a little to other countries and regions? Grenache, or Garnacha, is the main component in the aforementioned Châteauneuf-du-Pape, and most southern red Rhône wines. In its original homeland of Spain, or in the McLaren Vale and the Barossa in Australia, it can be very good indeed. Australian Grenache tends to be light on tannins, with soft generous ripe spicy strawberry fruits; great for turkey. 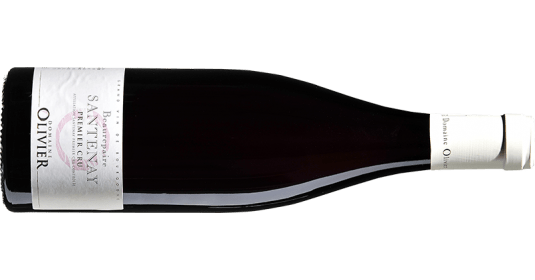 You could go with the excellent John Duval Plexus GSM 2015 (€39, independents), a Rhône-like blend of Grenache, Syrah and Mourvèdre. 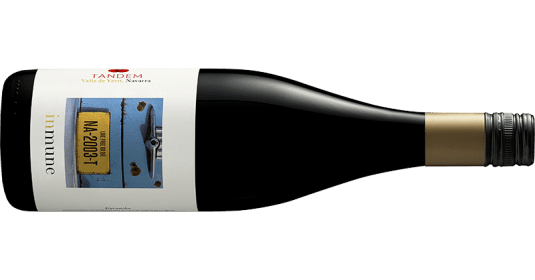 Spain is producing some really exciting Garnacha at the moment. As a general rule, look to Navarra for lighter, juicier wines, and Madrid or Méntrida for wonderful, perfumed, full-bodied wines. See below for just two suggestions. I am a big Pinot Noir fan, as are a number of my Christmas guests, so I suspect we will head in this direction, although I have served northern Rhône on previous occasions, most memorably an elegant, silky bottle of Côte Rôtie from Stephane Ogier (€52, searsons.com, Eldon’s, Clonmel). I have also been eyeing up some maturing Crozes Hermitage Yann Chave (€27.95, searsons.com, plus independents). You can find very good Pinot Noir from various countries, most notably Germany, Oregon, California, New Zealand, Germany and Australia, although it is hard to beat red Burgundy at its best, as in the Volnay below. Unlike turkey, goose welcomes tannins and eats them up, so a Barolo, Barbaresco or Bordeaux would be ideal. However, steer clear of red cabbage if it has lots of sugar, vinegar and spice. The same goes for duck, although here a Pinot Noir would also work nicely. Vegetarian dishes with mushrooms, or stuffed peppers, courgettes and aubergines are all very red-wine friendly, including wines with some tannin. If you live near Loughlinstown, a quick fix Christmas pairing from Whelehan’s would be the fruit-filled Rula Albariño (€14.95) and smooth, full-bodied Domaine de l’Amauve Côtes du Rhône (€16.50). 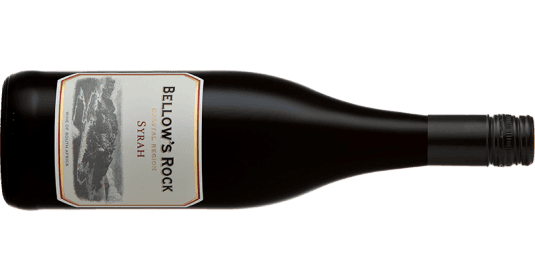 For a German Pinot, try the rich fruit-filled Bender Pinot Noir (€18.25, winesdirect.ie) or the spicy Stepp Pinot Noir (€22.50, Marks & Spencer), or the Becker Family Pinot Noir (€22, independents). Fresh, smooth, crunchy, savoury dark fruits with a lovely herbal touch. A very good match for the Christmas turkey and stuffing. A wonderful full-bodied wine with fresh, fragrant red cherry fruits and fine dry tannins on the finish. With turkey or duck. Stockists: Kelly’s, Clontarf, kellysofflicence.ie; Clontarf Wines, clontarfwines.ie; The Corkscrew, Chatham Street, thecorkscrew.ie; Green Man Wines, Terenure, greenmanwines.ie; 64 Wine, Glasthule, 64wine.ie. A richer style of Pinot, with succulent red cherry fruits and a very attractive earthiness. Perfect with duck, goose or turkey. 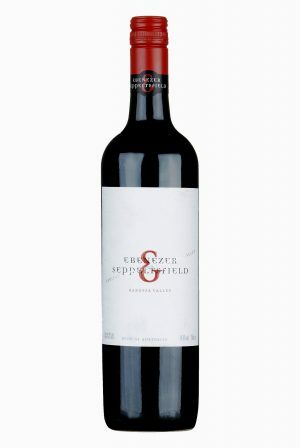 Youthful ripe dark cherry, with a touch of smoky new oak, underpinned by good acidity. If you are having it for Christmas, decant half an hour before dinner. Perfect with turkey, goose or duck. Josko Gravner lives in a modest house in Oslavia, in the north-eastern corner of Italy, just a few metres from the border with Slovenia. His mother tongue is Slovene and the family speak it all the time, as do many in the area. A casual visitor would struggle to understand that this modest unassuming man (proudly sporting a flat cap presented to him by his Irish importer) has been to the forefront of no less than two revolutions in modern winemaking over the last three decades. In the 1980s and early 1990s, Gravner was a winemaking superstar, one of the leading modernists in Italy, particularly in the Collio region. Taking over the winery at the age of 25, following his father’s death, he pioneered the fermentation of Sauvignon Blanc and Chardonnay in barriques, sometimes 100% new. The wines were given very high scores by American critics and the influential Italian magazine, Gambero Rosso. Then two separate events forced his life and his wines to change course radically. These changes lead to a rapid fall from grace, followed by a rise in fame for a completely different kind of wine. Gravner now has almost god-like status with the natural wine movement and fans of orange wine. Gravner comes with a reputation for being difficult with the press, possibly the result of fallout back in the 1990s, when the Gambero Rosso famously said he had ‘gone mad’. But on my visit, Josko Gravner was pleasant, open and very good company, despite a language barrier. 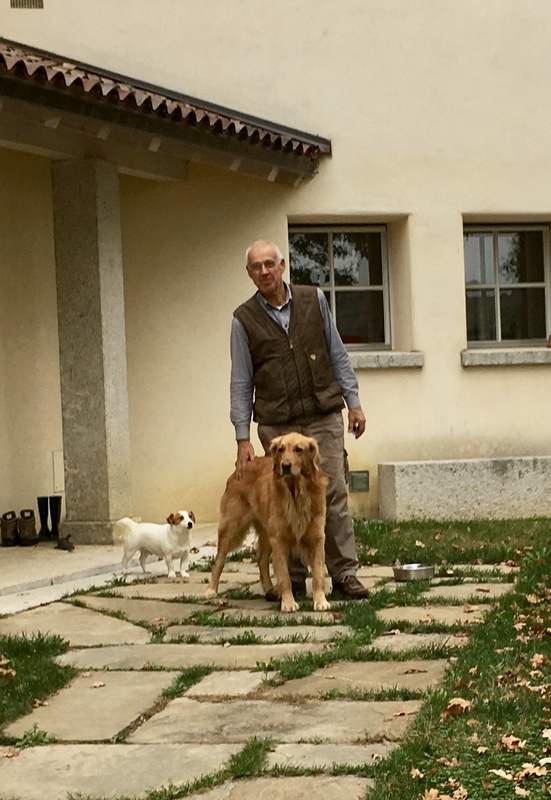 I spent the weekend in his house, with his daughter Mateja (a qualified winemaker) and grandson Gregor both of whom work alongside Gravner, as do Pepe and Bruno, his two inseparable dogs. Jana, another daughter, also works in the family business. It was a fascinating few days, an in-depth immersion in how natural, skin-contact wines are made, from the man who invented (or reinvented) it all. As a bonus, the region is very attractive, with an absorbing mix of cultures and history. 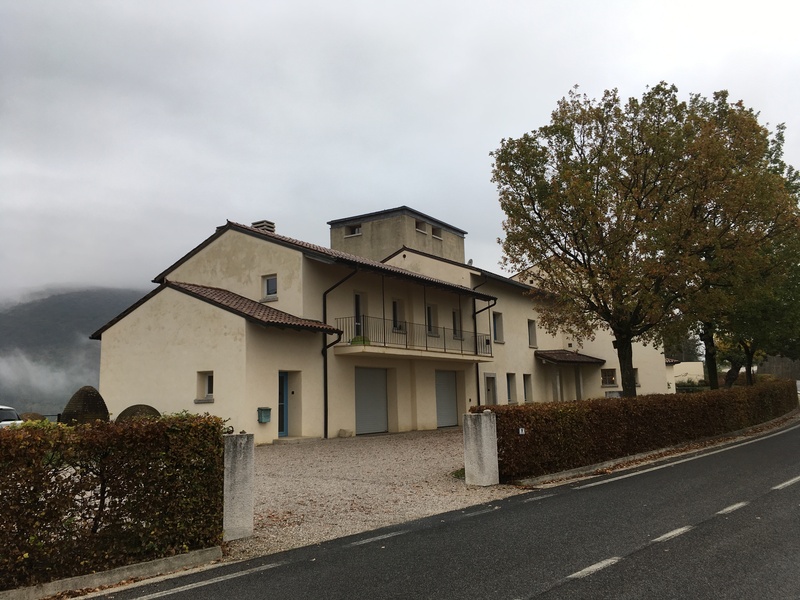 Gravner’s grandparents had an osteria where the winery now stands. It was a way of selling their wine, along with snacks such as salami, prosciutto, cheese and, apparently, hardboiled eggs. They closed it down in 1932, Mateja tells me, when the fascists made it law that everyone speak Italian; they wanted to be able to speak Slovene in their own home. 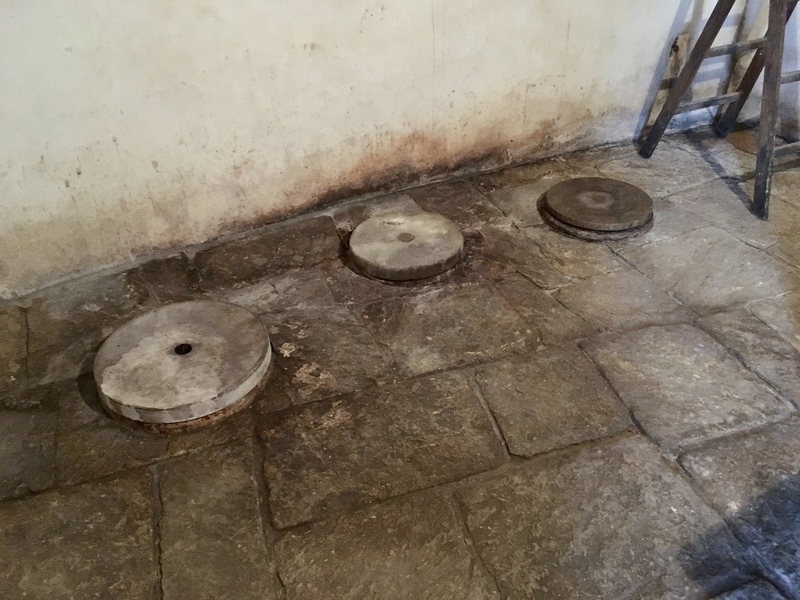 The grandparents were known for having a ‘clean winery’, something that the fastidious Josko Gravner has obviously inherited. Later the family had an osteria in the nearby town of Gorizia until the 1970s. His wife was born over the border in in Slovenia. Mateja told me many stories about life beside the Iron Curtain. Although there was no barbed wire, the area had many border guards, usually from other parts of Yugoslavia, to avoid fraternisation. Many of the winemakers had vineyards on both sides of the border, and had to be careful where and when they crossed. At one stage Josko had to transfer ownership of his grandmother’s house to his wife, as he stood to lose it as the Yugoslav government labeled all Italians as fascists; she held a Yugoslav passport and was therefore obviously a good communist! The first change in Gravner’s winemaking came about as result of a trip to California in the late 1980s. 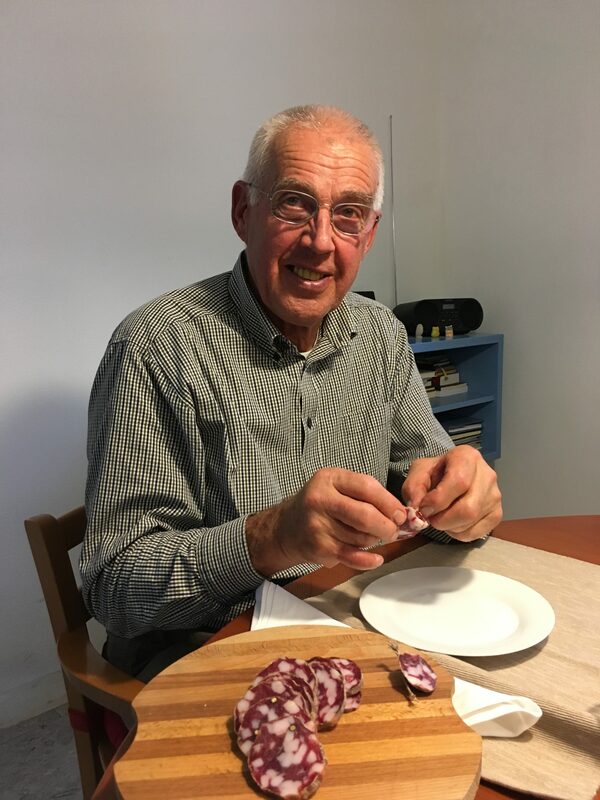 He was disgusted by some of the chemically enhanced wines he tasted, and returned home determined to make his winemaking and wines healthier, cleaner and more local. Suffering from ill-health, he and his wife began eating a diet of raw food, which gradually softened to semi-vegetarian. Now they eat meat twice a week at most. 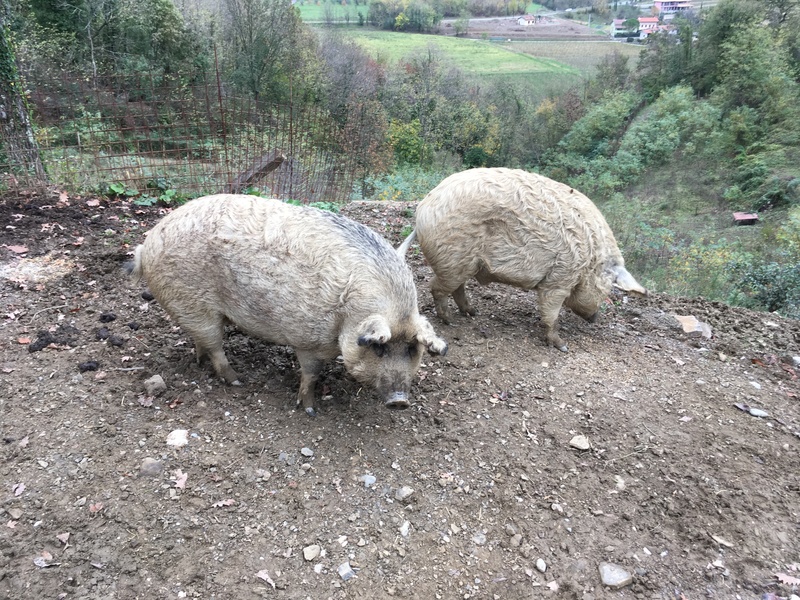 As Gravner rears a few woolly Mangalica pigs, from which he makes excellent salami and sausages, this must prove difficult. He does believe that you should buy locally as much as possible. “You pay for what you eat and drink”, he says, “with your health”. At the same time, Gravner wanted to improve the quality of his Ribolla Ghialla. Ribolla grows on both side of the border, more in Brda in Slovenia than Collio. It is, he argues, the only indigenous white grape of Friulli. Other local indigenous varietals, such as Pignolo, Schioppetino, and Tatsalenga, are red. “The problem with Ribolla is if you press gently you get a very neutral wine; if you press more, it becomes hard and very bitter.” He decided that the true taste of Ribolla came only with fermentation on the skins. In 1994, he made his first skin-contact wine. 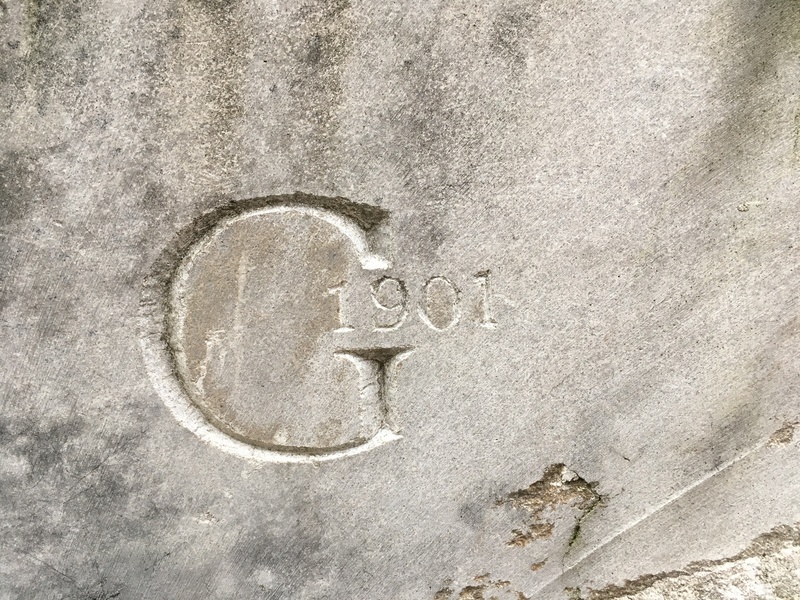 His research led him to Georgia, the home of skin-contact wines but also winemaking in amphorae. Gravner was smitten. “I tried to find the oldest way to work with wine; the only thing you need is great grapes. Everything a wine needs you will find in an amphora,” he says. Used for making and storing wine for thousands of years, amphorae are clay vessels of differing sizes, from 250 to several thousand litres. 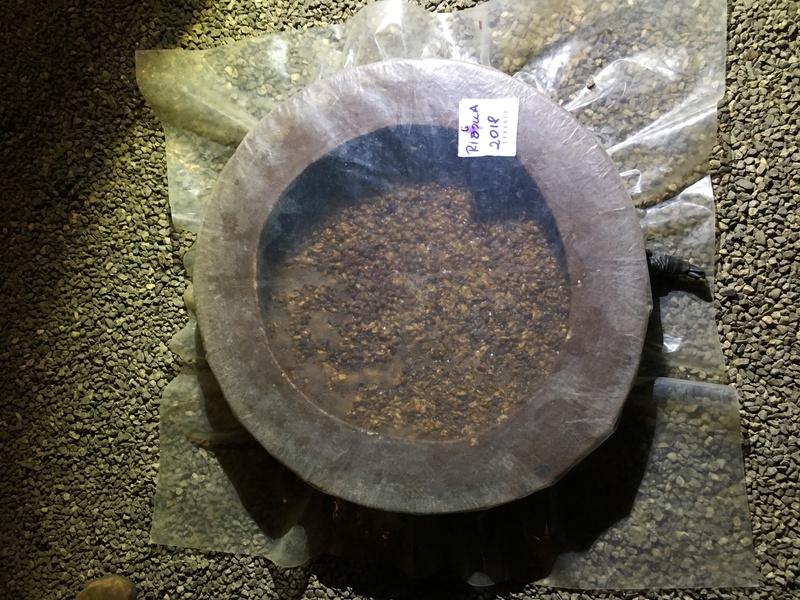 Most are around 400 litres and are often lined with beeswax. Most winemakers use them buried or half-buried in the ground. 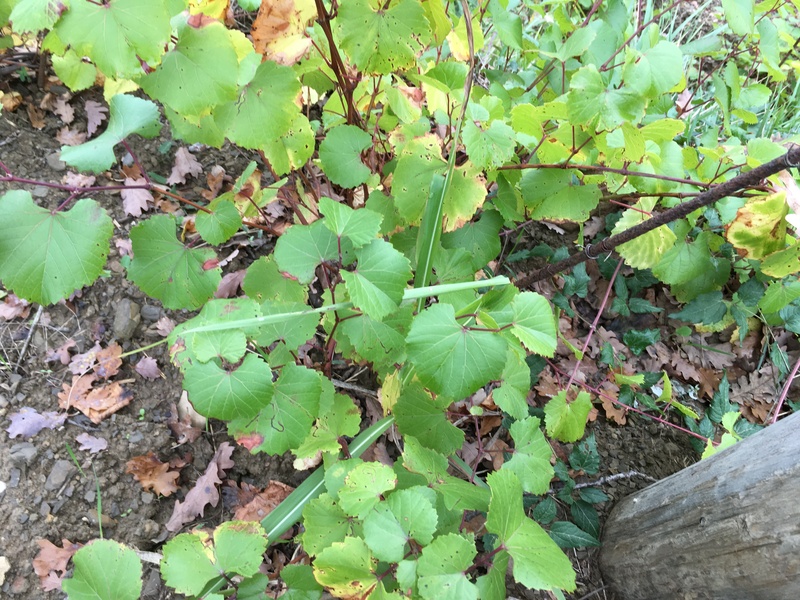 You can find them in Spain, Portugal, Italy, Chile and other countries, but they have been widely used in Armenia and Georgia for thousands of years, up to the present day. 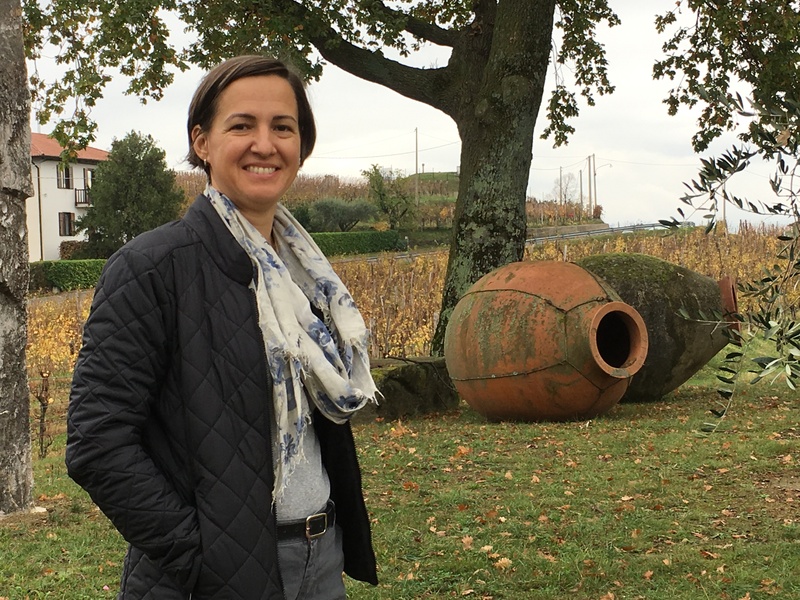 Thanks to Gravner, they are ultra-fashionable today with natural winemakers, who believe they make for a steady slow fermentation, give the wines freshness, and help reflect the terroir. 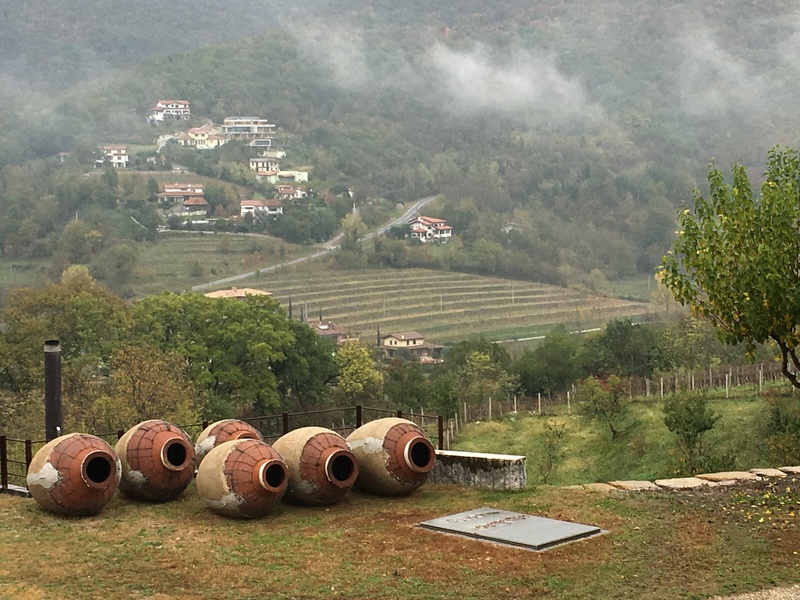 Gravner uses amphorae from 1,200 – 2,500 litres in size. 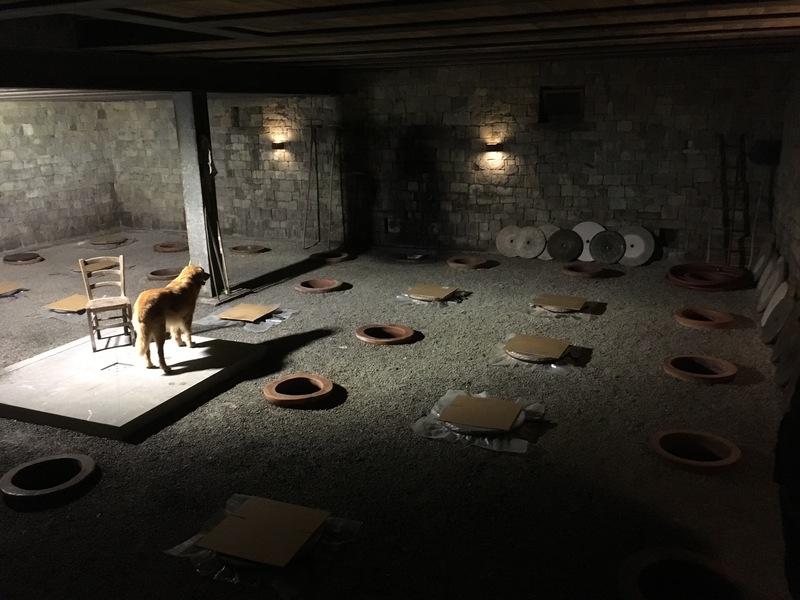 In 1997, he made his first amphora wine – in his grandmother’s old house just over the border in Slovenia, as he was afraid the Italian wine authorities would not allow it. The grapes, however, came from Italy. In 2000, he travelled to Georgia for the first time and bought some qvevri (amphorae). He uses only these and says they must be buried to be effective. 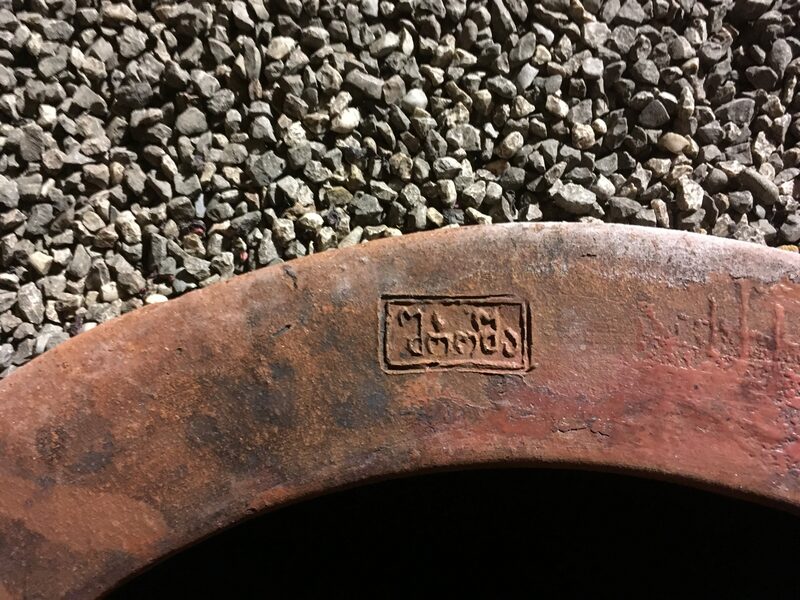 All of the amphorae he uses are brought in from Georgia. He currently has 45 in the cellar and is in the process of burying a further 21 outside. All are lined with beeswax. By 2001 he had enough amphorae to make 50% of his wine in them, the other half in barrel. The original amphorae, in the Gravner farmhouse in Slovenia. His first skin-contact wines (he prefers the term Amber to Orange: “Amber is more bright, alive, concentrated”) were met with derision by some. “It was very difficult at the start; people didn’t understand what I was trying to do,” says Gravner. Other producers thought the wines were faulty. He lost many customers in the period 2009-2012, and was partly saved by Italian sommeliers who liked the wines. Over the last five years, he says, nearly all his customers have returned to the fold. Gravner wines are fermented on the skins in amphorae; the whites spend one year on skins, the red wines a few months. This is followed by six to seven years in large Slavonian oak casks and then a few months in bottle before release. 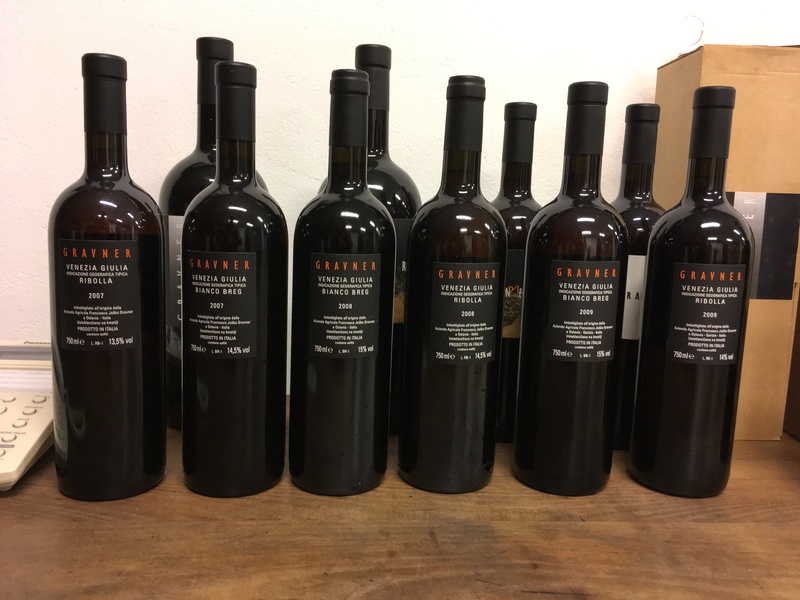 Gravner has an almost biblical belief in the number seven; he keeps his wine seven years before release, and he believes good and bad vintages come in sevens. As 2011 was the last great vintage he was hopeful that 2018 would follow suit. However, it was a difficult vintage, he says, requiring a lot of attention. 2019 however, will be very good. 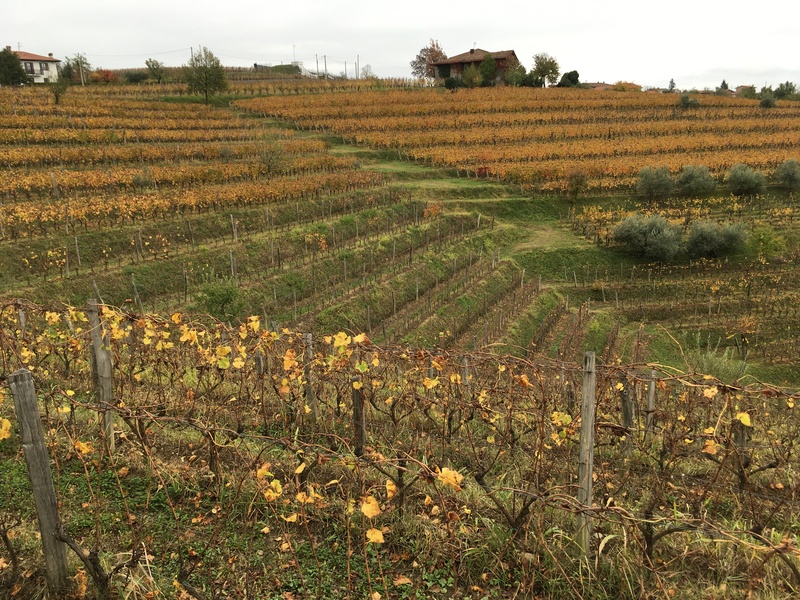 The Gravner estate is just over thirty hectares, straddling Italy and Slovenia, with seventeen of those under vine. Both figures change constantly as he buys new vineyards and sells plots he doesn’t consider good enough. Originally planted with Merlot, Cabernet, Pinot Grigio, and Sauvignon, they are slowly being replanted with Ribolla and Pignolo. He has planted trees and installed small ponds amongst the vines to encourage biodiversity. Talking to Josko Gravner later, he argues that “It is the only way to be sure the land is safe. I didn’t understand this when I first started out. Now I understand that the key to everything is to look after the land. It is difficult to say it makes the wine better, but it certainly the soil is better in difficult vintages and that makes things easier. There is no use in improving vines; you improve the soil and the vines will be more resistant. If you fertilise, you will have to use more fertiliser every year. Biodynamics is the most evolved style of agriculture, but it is like a religion, You have to believe in it. When you work with nature, you have to accept the good and the bad that nature gives you”. A friend of his argues that you have to accept that you will lose an entire harvest every seven years. Gravner plants ungrafted American rootstocks directly into the soil, and field grafts on his own massale selection a year later. Mateja tells me that he noticed that a number of his 12 year-old plants suddenly withered and died, within a week, at 10-15 years of age. He believes this was caused by the nursery grafting. His method means the vines need five years before you can harvest, but he argues it is worth the wait. Today, Gravner is revered many natural wine lovers. As the first person outside of Georgia to discover (he would say rediscover) skin fermentation and amphorae, he has obviously had a massive influence on winemaking over the last decade. Winemakers the world over now routinely use a little or a lot of skin fermentation or maceration, and amphorae have become a highly fashionable vessel to use in winemaking. Yet he dislikes travel and finds addressing large crowds a very stressful process. He produces very little wine, although they are now exported to forty five markets, the two biggest being Japan and the U.S. He is very modest man, if quietly persistent, and something of a perfectionist in everything that he does. I ask grandson Gregor, who recently started working with him in the cellar if that makes life difficult. “Not really,’ he says, “I enjoy the work very much, and when he says you have done a good job, you know that you really have”. He obviously questions everything; for instance he argues that bottles of wine should be stored standing up, as opposed to laid down. The cork has to be kept humid, not wet, he argues, so you just need the correct cellar. 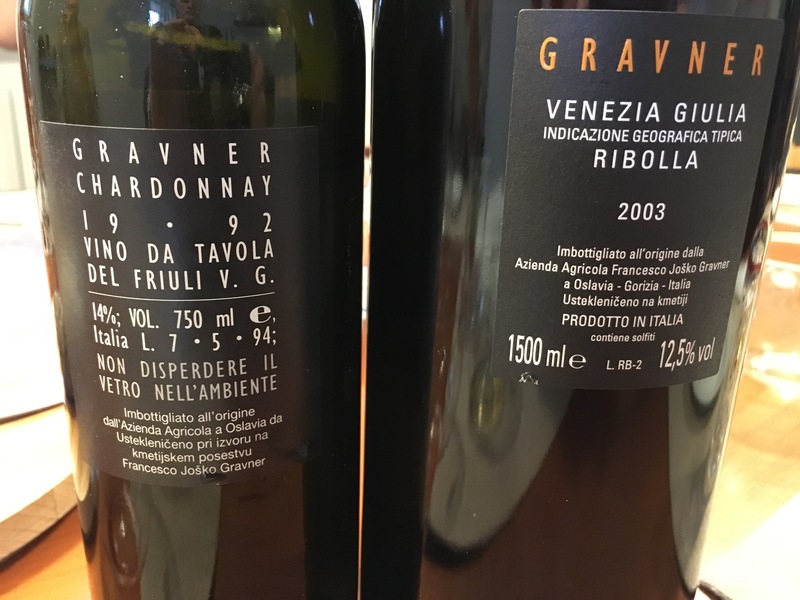 I am intrigued by the Gravner wines; they have a unique personality, and flavours that you will rarely find in conventional wines. They have none of the V.A., Brett, or mousiness found in some natural wines, and after seven years in the cask, they are unlikely to start refermenting. 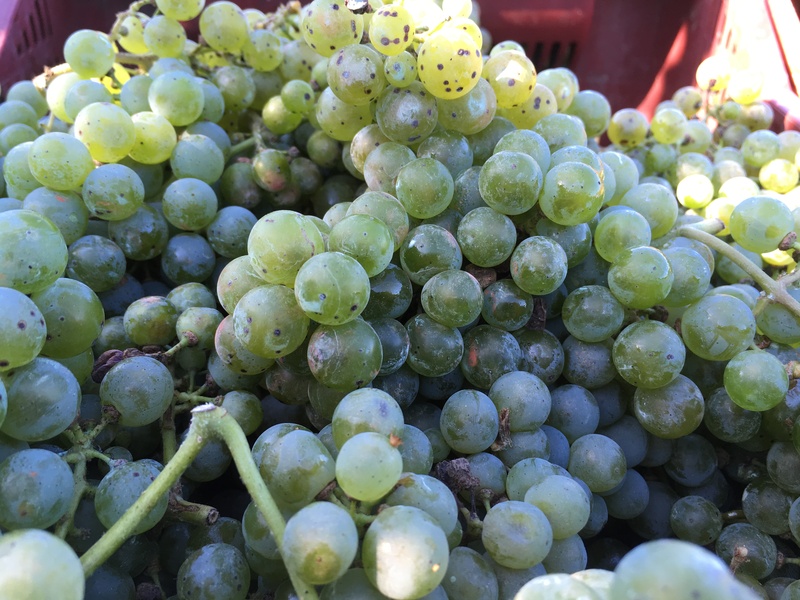 Some are marked by noble rot, some may have small levels of residual sugar, but most are very dry. They are complex, with layers of flavours – orchard fruits, lots of orange peel, lemon zest, minerals, grilled nuts, mushrooms, earthy, and sometimes with a waxy quality. Some simply explode with a rainbow of flavours. I found it difficult to write tasting notes or to judge the wines; they taste so different that the usual descriptors – lemon zest, peaches and balance etc., are irrelevant. He would argue that his wines reflect the terroir; several critics I have talked to say they all taste the same – of Gravner. I enjoyed every minute of my visit, and really enjoyed the wines. I am not entirely convinced I would drink them with food though. I would prefer to sit down with a glass (Gravner has designed his own glasses, made by Massimo Lunardon) and slowly sip it over the evening. 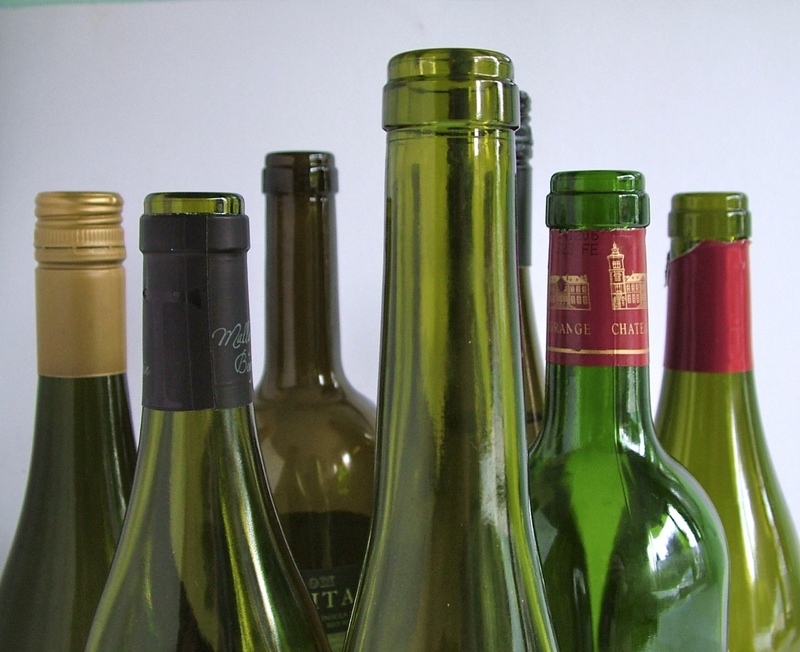 He argues that his white (or amber) wines should served at room temperature. Much is made of his white wines, but his red wines are equally enjoyable. An oak cask 2003 Merlot with a touch of Cabernet, fermented on the skins still had plenty of pure smooth plum fruits, as well as a great tannic finish. Because he has now ripped up all of his Cabernet and Merlot replacing them with Pignolo, it has not been made again. Gravner wines do not come cheap, but they are quite unique, and the result of a long complex process. One retailer said to me that every wine-lover should try a Gravner wine at least once in their life. I would agree. 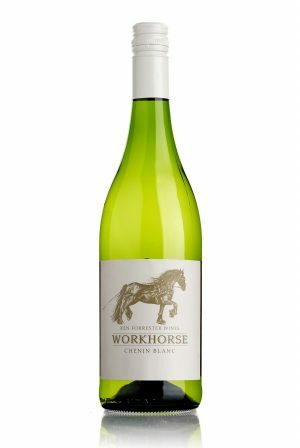 Made from a blend of Chardonnay, Sauvignon Blanc and Pinot Grigio. Floral, herbal aromas; rich tangy and full of soft complex fruits. Vibrant, mineral with a lovely taut freshness. Some noble rot; riper, richer and spicy, with orange peel, dried apricots and figs. Long and quite luscious, although there is still plenty of acidity. Cleaner and fresh with a strong mineral streak; smooth with subtle grilled nuts and a citrus element. Lifted aromas of dried fruit and orange peel; an explosion of fruit and flavour; marzipan, caramel, nectarines, underpinned by a fine refreshing acidity. A win with great power and complexity; rich with intense flavours of toasted nuts; waxy with layers of dried stone fruits, and a very long finish. Abundant dried apricots, candid fruit and spice – ginger and fennel, with subtle nuts and a lovely mineral streak. Mainly Merlot, a little Cabernet Sauvignon. Still a very youthful colour, broad slightly earthy nose with dark forest fruits; smooth, ripe mature damson fruits with a nice tannic kick on the finish. Legally, this cannot be called Riserva, but it is a Gravner Riserva, having spent seven years in cask and seven in bottle. This was bottled only in magnums, left standing up (Gravner insists this is the way to age wine, provided you have the correct humidity) A very delicate nose of rose petals and lemon peel; it has good acidity, subtle grilled nuts, and an amazing freshness for a fifteen year-old wine. We finished one of our tastings with a taste of one of his barrel-fermented ‘old style’ wines that showed remarkably well; it still had aromas and flavours of new French oak, but was very much alive with good apple fruits and a long dry finish. How many Burgundies would taste as good at 25 years? Pinot Grigio; Mild earthy – damp earth, with light fruits. Not my favourite but an interesting piece of history. 15.5% alcohol, five months on skins. 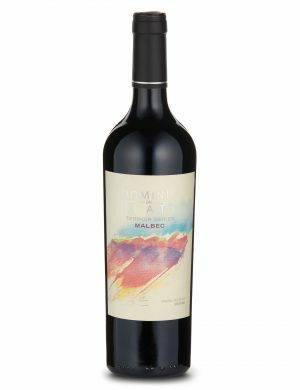 Deep in colour, rich in red fruits, with a pithy texture and quite tannic on the finish. As near as white wine gets to red? Fascinating wine. In this country, the traditional white wine for Christmas dinner is Chablis or Mâcon, or maybe Chablis Premier Cru if we are feeling prosperous. These Chardonnays from Burgundy are a very good choice to accompany smoked salmon, prawns and a main course of turkey and ham for those who don’t drink red wine. If you are having oysters, Chablis is perfect as is a good Muscadet. Turkey by itself, like chicken, goes very nicely with virtually any wine, red or white. It is the trimmings that make finding a wine a little more complicated. If you do want to stay with a Chablis Premier Cru, Whelehan’s have the excellent Domaine du Colombier Vaucoupin 2015 (€35) and Marks & Spencer the very stylish refreshing Côte de Lechet 2015 (€30). From elsewhere in Burgundy I was very taken with both the Domaine Olivier Santenay Clos des Champs (€29.95) and the St Véran, Château Fuissé (€20.45) both from O’Briens. However, this year why not impress your family and guests with an alternative from outside of Burgundy? 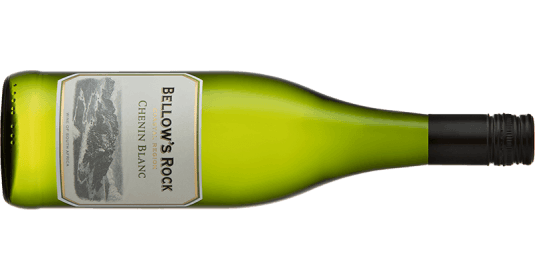 It doesn’t have to be a Chardonnay, but the Giant Steps below would make an excellent choice, or if you are on a budget, the Aldi Lot Series Lot XI Australian Chardonnay (€13.99) is a well-made, crisp, elegant wine. There are plenty of options beyond Chardonnay. Most rich white wines will have the body to take on turkey and all of the accompanying sauces and stuffings too. 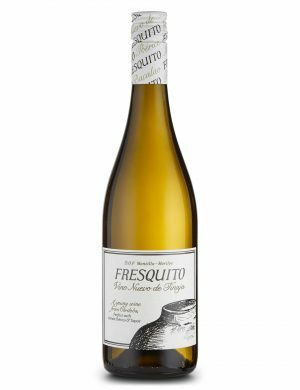 Galicia in north-west Spain offers all sorts of great white wines, including Albariño from Rías Baixas, Treixadura from Ribeiro and (best of all with turkey), Godello from Valdeorras. These names may not trip off the tongue, but they really deliver plenty of flavour. Most have a richness of fruit that makes them ideal with a seafood starter and the turkey to follow. 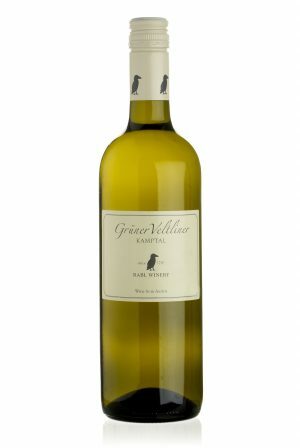 Or you could cast your net a little wider and try a Grüner Veltliner from Austria (one of the great all-purpose wines). Marks & Spencer has the very well-priced Rabl Grüner Veltliner for a very reasonable €13.30, while O’Briens has the rich, luscious Käferberg for €24.95. Or you could treat yourself to the sublime Ott Fass 4 Grüner Veltliner (€27, independents). A Riesling of any kind will go well with goose, the acidity cutting through the rich fatty meat. An off-dry German Riesling Spätlese or a drier Trocken would make a great match. Red wines provides the best match with roast duck and I will cover this next week, but a Austrian Grüner Veltliner would do nicely here too, as would a Gewürztraminer. Returning to turkey, other rich whites worth considering include Viognier (the best come from the northern Rhône) or a rich Chenin Blanc from South Africa. Whatever wine you choose, don’t over-chill it! It is a sure way to kill all of those wonderful flavours. A delightful harmonious wine balancing crisp acidity, elegant rich peach fruits and a tantalising hint of toasted almonds. With salmon, prawns or turkey. One of my all-time favourite wines. Textured and creamy, with plump pears and peaches, a subtle nuttiness, shot through with a lively acidity. If you want to splurge, their As Sortes (€50) is even better. With your Christmas starter and turkey. Stockists: Jus de Vine, Portmarnock; La Touche, Greystones; Whelehan’s Wines, Loughlinstown; Martin’s Off Licence, Clontarf; 64 Wine, Glasthule; Baggot Street Wines, Baggot Street; Blackrock Cellar, Blackrock; Clontarf Wines Clontarf; Green Man Wines, Terenure; Sweeney’s Wines, Glasnevin; Lilac Wines, Dublin 3; Grapevine, Dalkey; SIYPS.com. Soft luscious stone fruits, peaches and nectarines, with subtle toasted nuts and a snappy crisp finish. Perfect all-purpose Christmas dinner wine to drink with prawns, smoked salmon, turkey and ham. Of all the supermarkets, Marks & Spencer try the hardest; they certainly have the best and most adventurous range of wines. I think I have noticed a slight thinning out in Ireland at least, but it is still superior to all of their rivals, with an amazingly eclectic list of wines from all over the globe, with a heavy emphasis on the Mediterranean. At entry level they have a range of House Wines and other wines priced at €7.50-8.00. Some of these are very good. Below a small selection of my favourites, from €9 to €52.50 from recent tastings. This article was first published in The Irish Times online edition. The alcohol is removed by a process known as reverse osmosis, leaving a fresh, juicy, fruit-filled glass of alcohol-free wine. You miss the alcohol a bit, but this would go down a treat at parties and any other get-together. 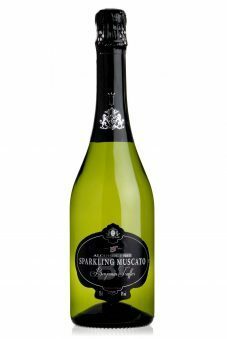 Made in the same way as Prosecco, this is a fresh, fruity, lightly sparkling wine with clean apple fruits. Not too sweet; I would prefer it to most Prosecco. Great value for money, and worth keeping in mind with the festive season ahead. If you are having a gang around, a magnum creates a real sense of occasion, and this one is very good. Champagne from a magnum generally tastes better too. Real depth and length, with rich creamy complex apples and brioche. Perfumed and delicate with very attractive soft floral stone fruits and citrus. Great value for money. Vermentino, usually found on the island of Sardinia, has been planted in Tuscany, and now Sicily in recent years. It has the great advantage of retaining acidity in warm climates. An old favourite of mine. The current vintage is fresh and crisp, with lovely rich ripe peaches and subtle nuts and a dry finish. Try it with creamy pasta dishes or chicken. Excellent value for money. The Palataia Pinot Noir is pretty good and well-priced, but his was my first taste of the Pinot Blanc. It is very good, crisp and dry with very attractive pear fruits and a dry finish. A good all-purpose white to serve as an aperitif, with fish and seafood or white meats. This is one of my all-time favourite M&S wines, and I was delighted to see a new vintage appear recently. Made in clay amphorae in Montilla-Moriles, it is an utterly delicious, vaguely sherry like (but unfortified) wine with delicate toasted nuts, green olives and plump apricot fruits, finishing dry. Amazing value for money. Attractive brisk gingery green apple fruits and a crisp dry finish. Well-made, easy-drinking and good value for money. It is rare to find any Austrian wine at his sort of price, and this is a pretty good example. 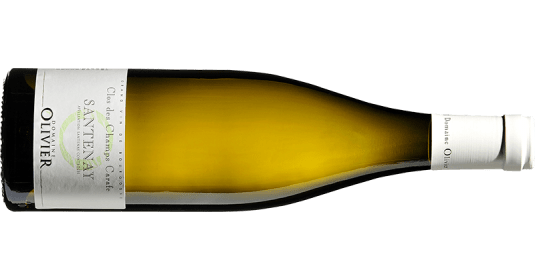 From the cooler Adelaide Hills, a very nicely crafted crisp dry Chardonnay, with no obvious oak; just ample apple and pear fruits, with a solid backbone of acidity. Light enough to partner seafood, and enough body to accompany chicken. Very good value for money. Galicia produces some fantastic white wines, including Albarinho from Rîas Baixas and Godello from Valdeorras. This wine, made mainly from the unpronounceable Treixadura grape, is well worth trying; very lovely plump apricots, a subtle saline touch, finishing dry. Nice wine. With scallops or prawns. Very floral and aromatic, with racy acidity and attractive refreshing fruit. Nice wine. Is this how an Irish wine might taste in the future? 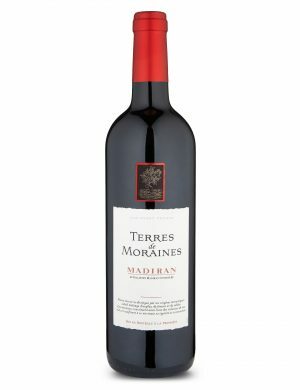 Madiran can be tannic and chewy, but this version is very accessible with good smooth ripe blackcurrant fruits, and light savoury tannins on the finish. Perfect with a steak or grilled duck breast. Cabernet Sauvignon from Chile covers all bases, from great structured wines to soft and sweet. This hits the mid range with decen structure and very good fruits. A very fine Cabernet, with clean blackcurrants and cassis, a refreshing seam of acidity and a good dry finish. Roast lamb or beef. 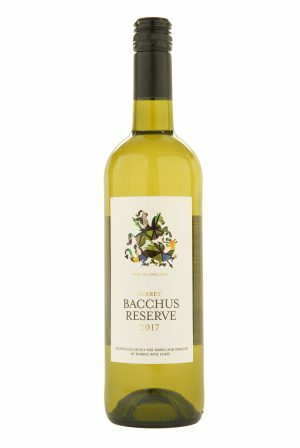 Marks & Spencer has a track record for listing wines from lesser-known countries; this time it is Uruguay, producer of some very good wines, with the South-west French variety Tannat being their specialty. This version is ripe with soft dark fruits, sprinkled with spice and wood smoke. One to try with barbecued beef. 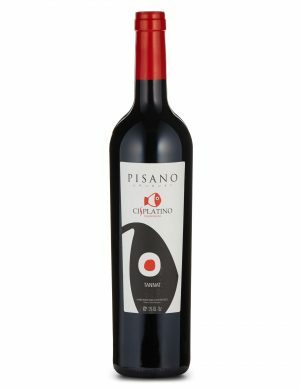 Intensely aromatic, all violets and dark fruits, with delicious fresh, lightly spicy plums, dark cherries and mint on the palate. Belly of pork or lamb chops. An Australian classic, of a style that is not easy to come across these days. Big, powerful hedonistic sweet ripe dark fruits, lots of spicy vanilla oak, and a very good finish. Not for the faint-hearted, but perfect with all sorts of red meats dishes on a cold winter evening. A cuvée of80% Cinsault and 20% Grenache from the legendary Lebanese producer. Juicy dark cherries and raspberries with a lovely spicy touch. Very tasty wine. With a lightly spicy lamb tagine. 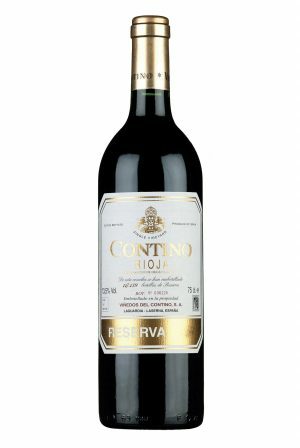 Contino was the first single-vineyard Rioja, created in 1973. The wines are always impeccably made. An excellent young Rioja with very concentrated blackcurrant fruits, firm structured tannins and great length. Ideally you would stash it away for a few years. If serving now, decant before serving. Perfect with roast lamb. 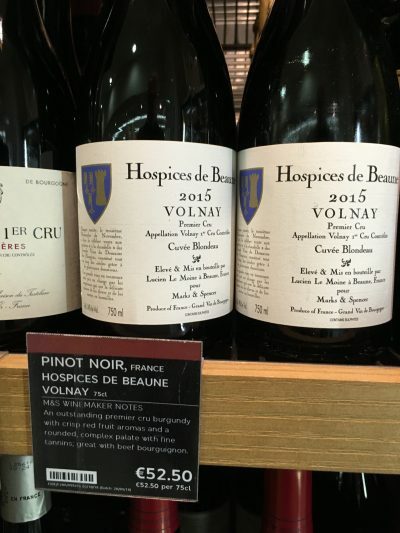 This was bought by Marks & Spencer at the annual auction at the Hopsices de Beaune. Expensive but good Burgundy is not cheap. A relatively young wine that will improve further with a little age. Youthful piquant ripe dark cherry, with a touch of smoky new oak, underpinned by good acidity. If you are having it for Xmas, decant ½ hour before dinner. Perfect with the Christmas turkey. 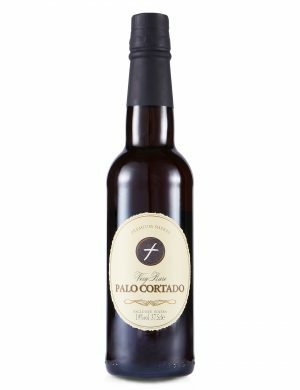 Made by Lustau, this is the perfect Christmas treat for the Sherry lover in your life. Intense, bone dry and wonderful, this has masses of toasted nuts, dried fruits, orange peel and much more besides. Drink with a plate of hard cheese, crackers and walnuts. These are my favourite wines from a Recent Dunnes Stores press tasting. 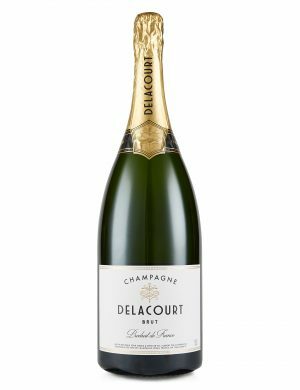 Made only with Chardonnay, this is a very superior, bone-dry champagne, with elegant, mineral green-apple fruits, a touch of brioche, and good length. Ideally, you would lay it down for a year or two, but it’ll also be good now, with nibbles or fish dishes. Aldi has been working hard to improve its wine range, and now have a pretty decent core range of wines. These are my favourites from its Christmas line-up, which are set to be available from all 133 of its Irish stores.